Vanessa Splinter is among a small group of artists working with printmaking through Yarrenyty Arltere Artists in Larrapinta Valley town camp on the outskirts of Mparntwe (Alice Springs). 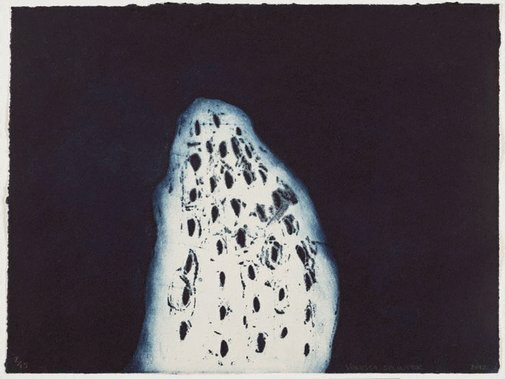 She only began working with the centre in 2011, but is already becoming recognised for her distinct prints that explore various aspects of the Central Desert landscape. Splinter often works alongside her mother, Marlene Rubintja, a recognised artist in her own right. This intergenerational approach is central to Yarrenyty Arltere Artists’ success and allows families to work together exchanging stories and history as they work, ensuring cultural information is passed on to younger generations. Splinter is a young artist with strong connections to the Western Arrernte community around Mparntwe and Gurindji country, further north. In 'Ant Hills' 2012 Splinter has reduced the landscape to a singular element. Ambiguously rendered in a field of brilliant blue the form has an ethereal resonance. Splinter's distinct use of blue is somewhat unexpected in a work relating to the Central Desert, allowing the mundane form of the ant hill to transcend its simplicity. Signed bot.c., pencil "Vanessa Splinter". Dated l.r., pencil "2012".